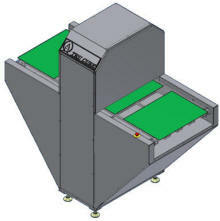 Single Sided Curing System: Can be used to cure any Thermal Inks: Legend Ink, Via Hole Fill, and Peelable Solder Mask. Cycle-Time of 2 Minutes or Less: With sustainability in mind, the Model TCL241-SS reduces curing times by up to 80%! Plus, the system can be turned off when no panels are present. Once panels are ready to be cured, the System only requires 5 minutes to heat-up. Small Footprint: With limited floor space in most facilities, the Model TC241-SS only requires 22 square feet. Control Panel: Adjustments for the conveyor speed and power setting for cure zone are located on the Control Panel. In addition, the Control Panel displays the actual temperature of the PCBs being cured. Lamps used in this system are very efficient. The total time for a PCB to travel through the IR system is 2 only minutes! Warm-up time of the system is less the 5 minutes! Constructed of 304 Stainless Steel. Housing are designed by ACS and provide uniform heat distribution across the curing web! IR thermometer reads the actual temperature of the PCB being cured and is displayed on the Control Panel.